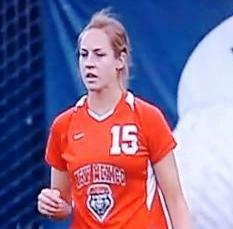 By now, most of us have probably seen the vicious attacks by University of New Mexico Women's Soccer player Elizabeth Lambert on her Brigham Young competitors. They earned her an indefinite ban from the sport. Though most who saw her actions were shocked and dismayed, and condemned her display of unsportsmanlike conduct, someone liked what he saw. World Wrestling Entertainment Chairman and CEO Vince McMahon called Lambert offering her a job. I was unable to reach Mr. McMahon personally, but was able to reach a spokesman for WWE, who confirmed that an offer had been made. "We would love to have Elizabeth Lambert on board. She could be the next WWE Diva. That hair pull takedown may have gotten her in trouble in soccer, but in professional wrestling, it could take her places. That could be her signature move, the pony tail ripper!" He went on to say, "She was so vicious, that she would be a natural bad guy wrestler. She might need a little work; some strength training, a nice pair of implants, and some tattoos if she doesn't already have them, but then she would be good to go. She may even be up for more than just for girl-on-girl action. The Intergender Championship was been vacant since the end of Andy Kaufman's wrestling days. She might even be able to fight and beat a man, winning that championship for the first time in decades." The representative I spoke to at WWE even hinted that they might have actor Tony Clifton guest announce her first intergender match.